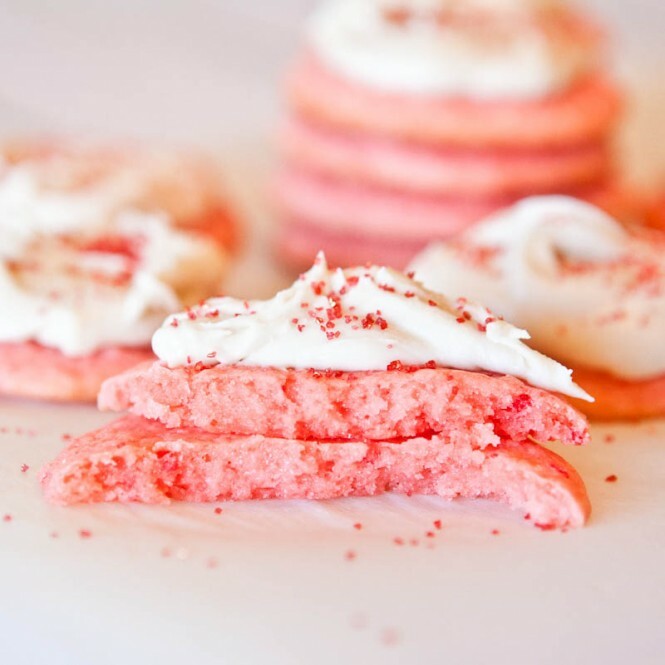 I have been wanting to blog about these cookies for a couple weeks but didn’t want to post pink food too far in advance of Valentine’s Day. However, it’s never to start thinking about pink food. Plus, spring is right around the corner. Right after that four feet of snow, for many of you, melts. I made these cookies on Skylar’s first day of school at her new school. 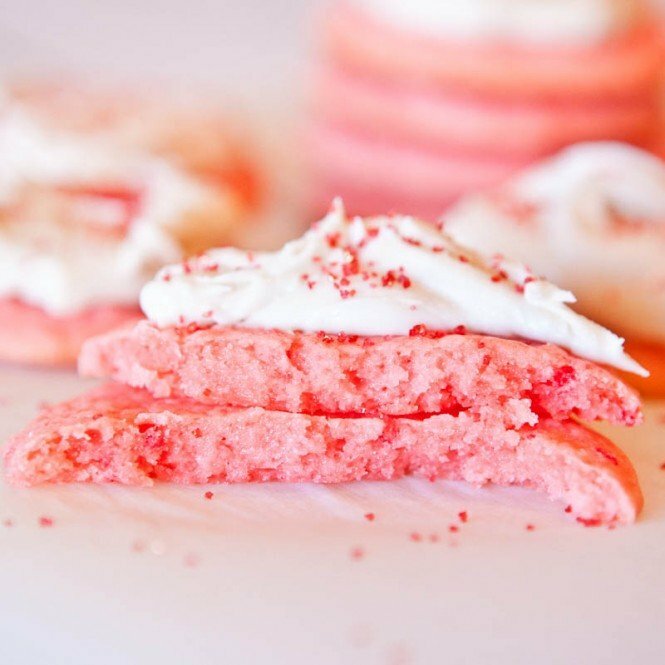 I was such a wreck that day and didn’t know what to do with myself so I started baking and pink food. 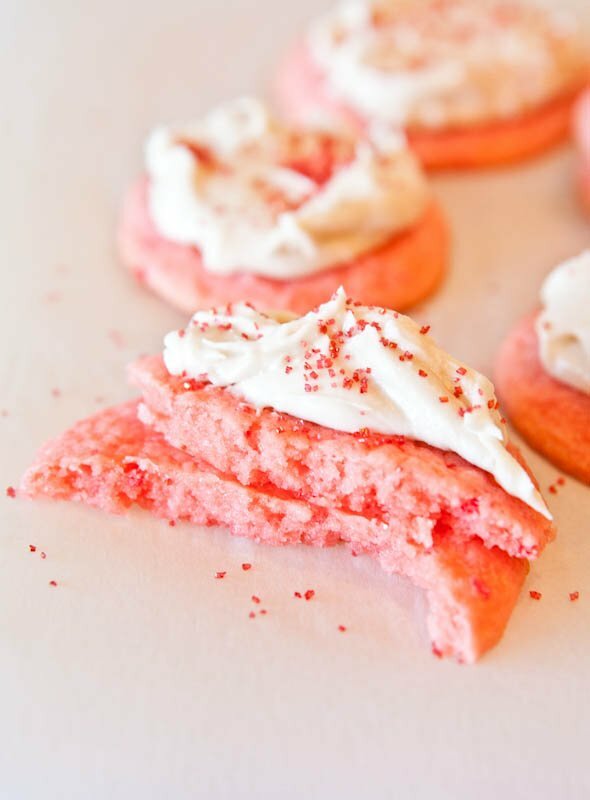 If strawberry cookies with a thick layer of vanilla cream cheese frosting and red sanding sugar sprinkles don’t put a smile on your face, I’m convinced that nothing will. These cookies and baking project helped to take my mind off the fact that my “baby” was at big girl school. When I told her I made pink cookies with sprinkles her eyes got as big as saucers and the smile on her face was enormous. For my little princess, who’s favorite color is pink, these were a huge hit with her and a perfect treat after her first day at the new school. 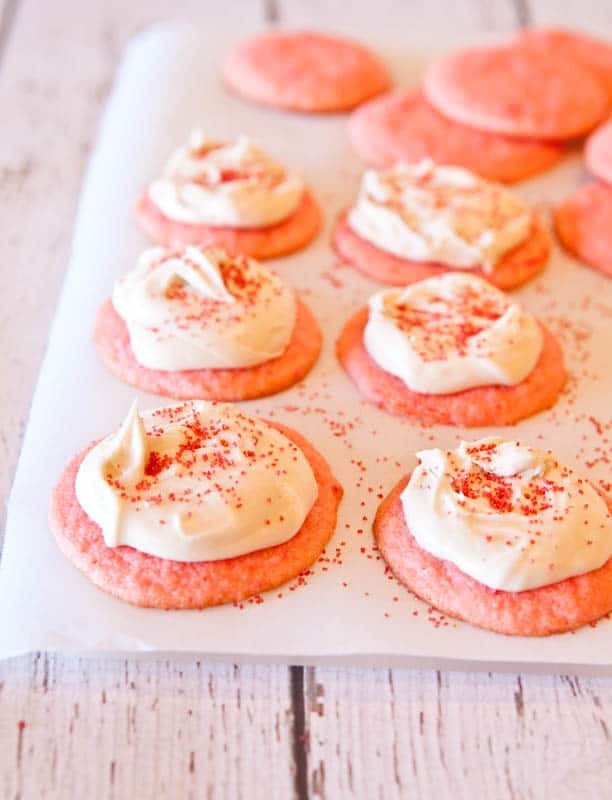 The little cookies are moist and light and have the best strawberry flavor, which is balanced with the heavier, richer, and tangier cream cheese frosting. And they are so soft, and so very, very moist. Practically falling apart moist which is the only way I like baked goods. 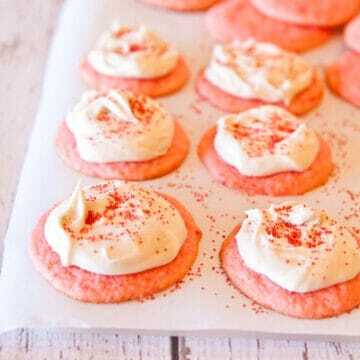 I hope you try the strawberries cookies, which are so easy, and only use four ingredients. I am all about taking a shortcut here or there and using a boxed mix if it’s going to give me great results. 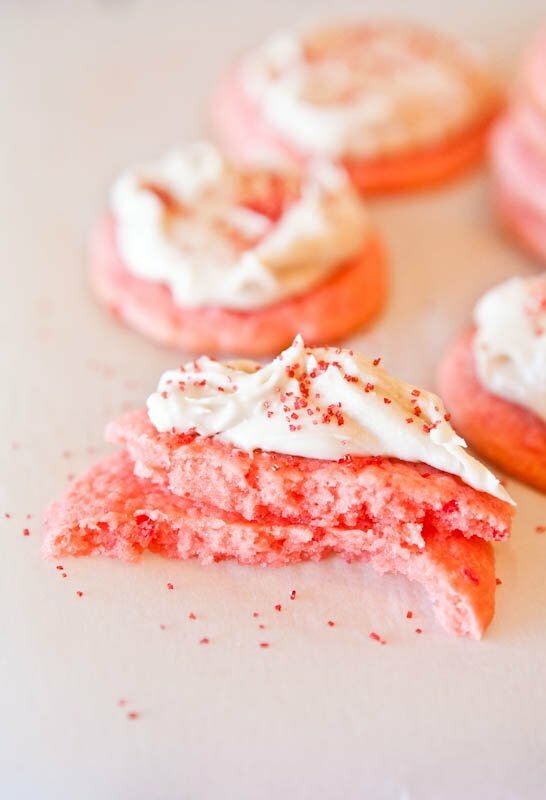 Pillsbury already has the strawberry cake mix thing all figured out and I don’t need to reinvent the wheel. I’d rather spend my time eating one of these. 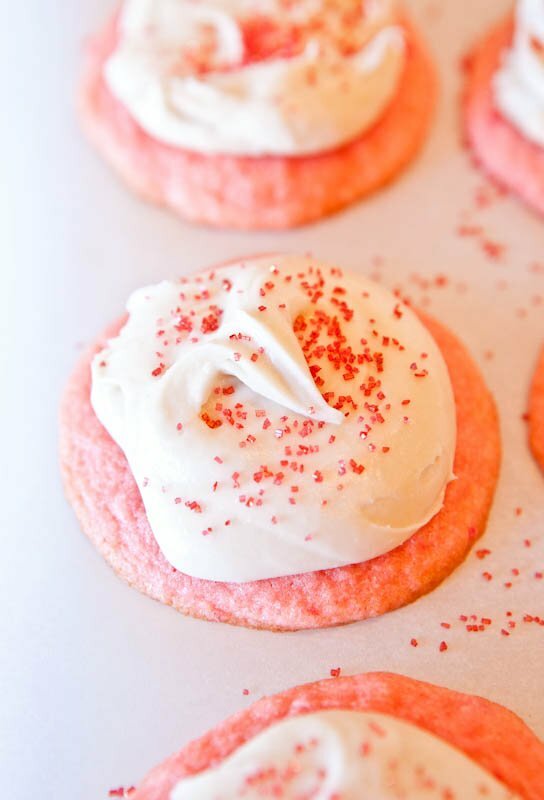 Soft, light, fluffy cookies that have rich strawberry flavor and are a cinch to make. 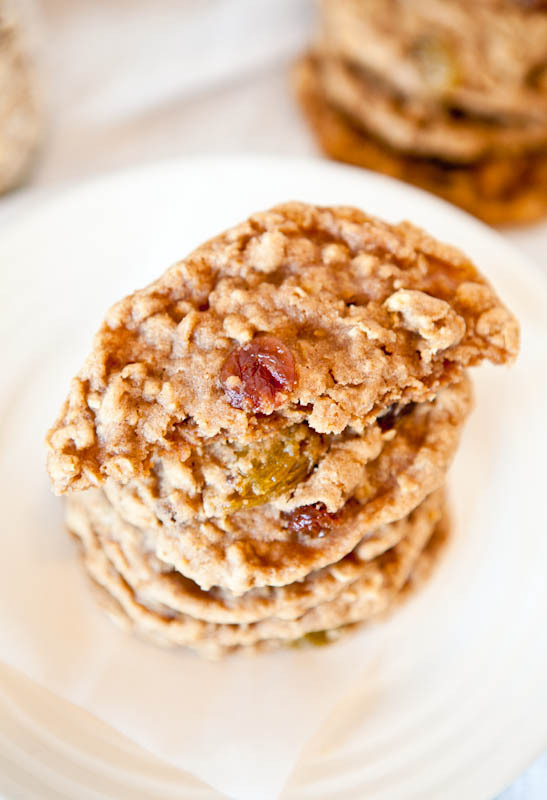 Cake mix cookies always turn out so well, and they’re always very soft and supple. Perfect for Valentine’s Day, Mother’s Day, Easter, bridal or baby showers, or any time you have a craving for strawberries. 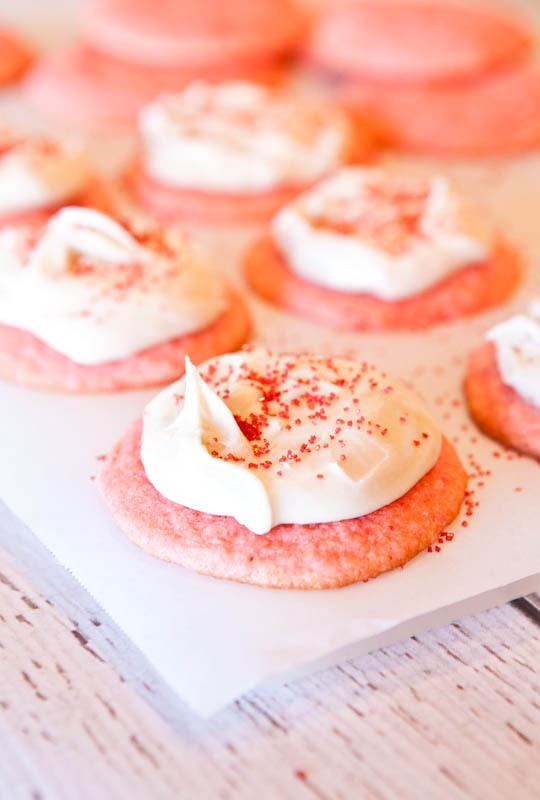 The tangy cream cheese frosting pairs perfectly with the sweet cookies. 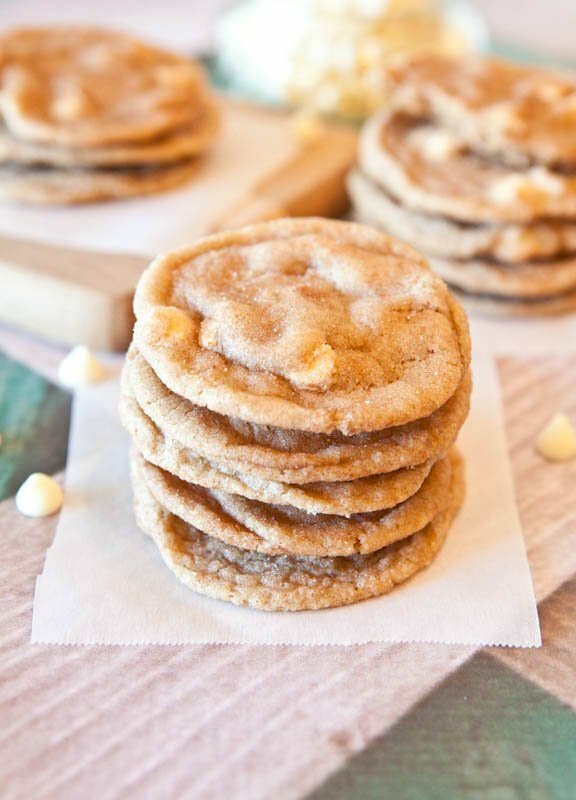 Cookies – Preheat oven to 350F. In a mixing bowl combine the softened butter, egg, vanilla and stir by hand or with a mixer until combined. Add the cake mix and stir until smooth. 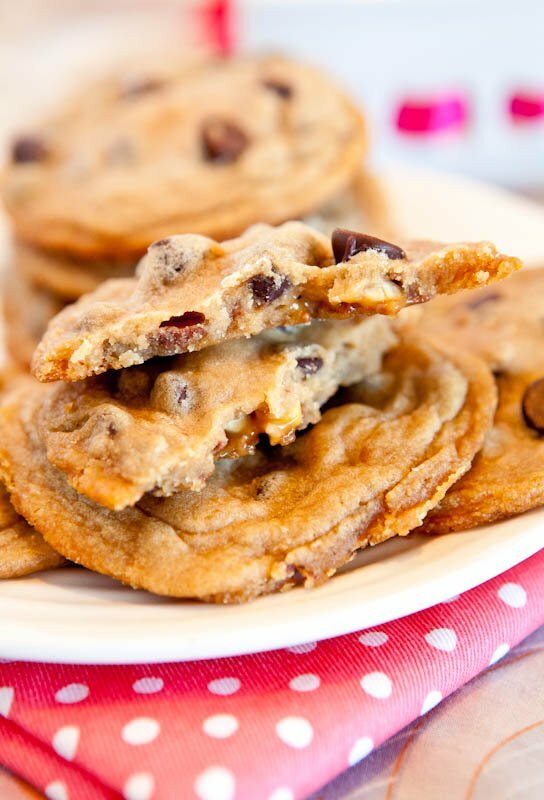 If the dough seems too wet to be cookie dough, add a bit more cake mix, one tablespoon at a time, until it’s less wet. Conversely, if the dough seems dry and it’s not combining, add a tablespoon or two of water. If time permits, I recommend chilling the dough by placing the mixing bowl in the freezer for 15 to 20 minutes. Chilled dough spreads less during the baking process. Form 1 inch balls on a Silpat-lined, parchment paper-lined, or cookie sheet that has been sprayed with cooking spray. Allow for adequate spacing because they do spread; which is why I recommend chilling the dough and do not exceed 1 rounded tablespoon-sized or 1 inch sized balls (I only placed 9 cookies on one cookie sheet and do not recommend trying to fit the batch on one cookie sheet). Bake at 350F for 8 to 10 minutes or until cookies are barely browned. They make look a bit loose and jiggly after only 8 to 10 minutes but they will continue to cook on the sheets after you remove the from the oven and will firm up as they cool. Do not overbake. Allow the cookies to cool well (on the cookie sheets is fine) before attempting to move them. 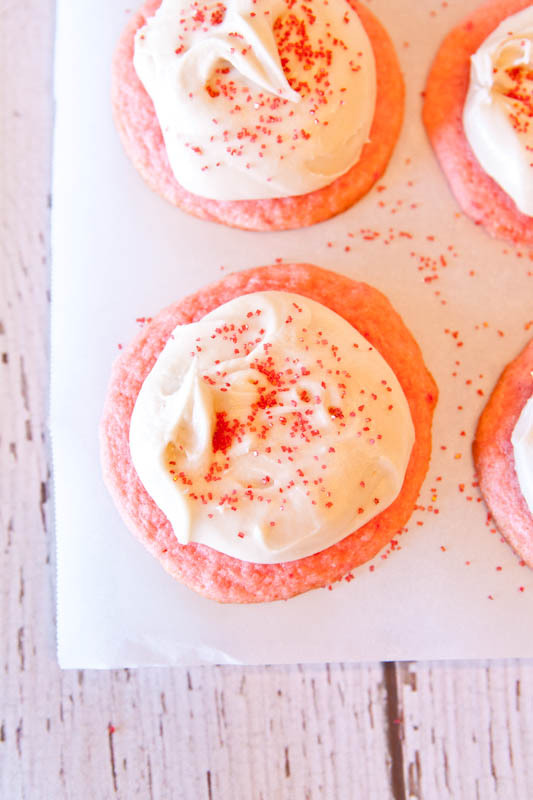 While the cookies are baking, make the frosting. 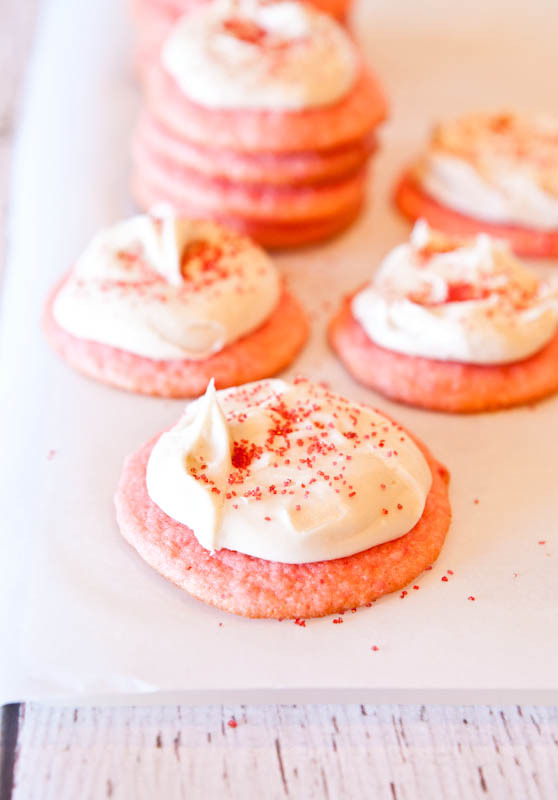 Frosting – In a large mixing bowl, beat together the butter and cream cheese with an electric mixer or whisk by hand. Add the vanilla extract and add two cups of powdered sugar and mix until smooth. 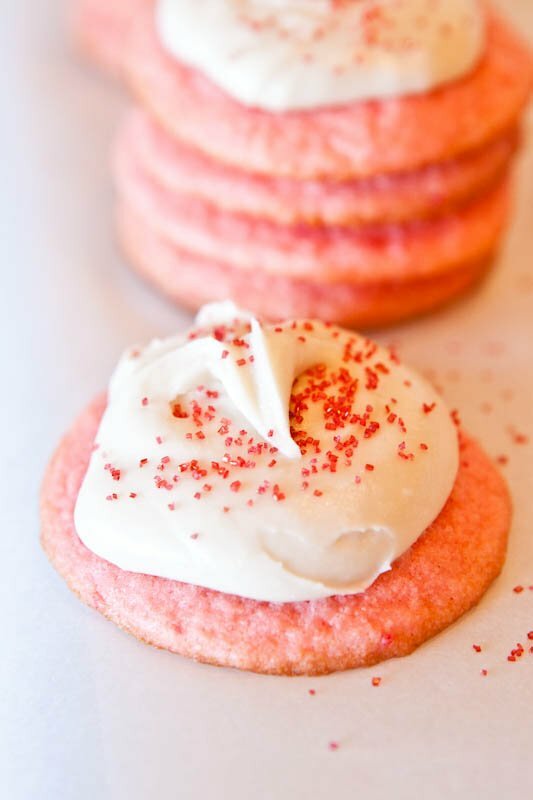 If you like thick(er) frosting, add more powdered sugar until desired consistency is reached. I used nearly 4 cups of powdered sugar in mine because I like very thick frosting (shown in the photos). After the cookies have cooled, frost them (I applied a thick layer). 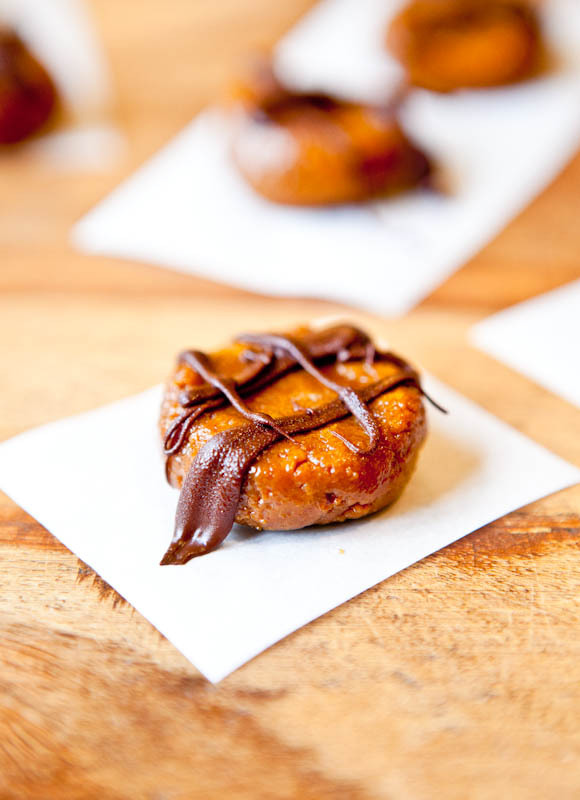 Finish with sprinkles, sanding sugar, or other garnishes such as coconut flakes or chocolate shavings, as desired. Optionally, make sandwich cookies. 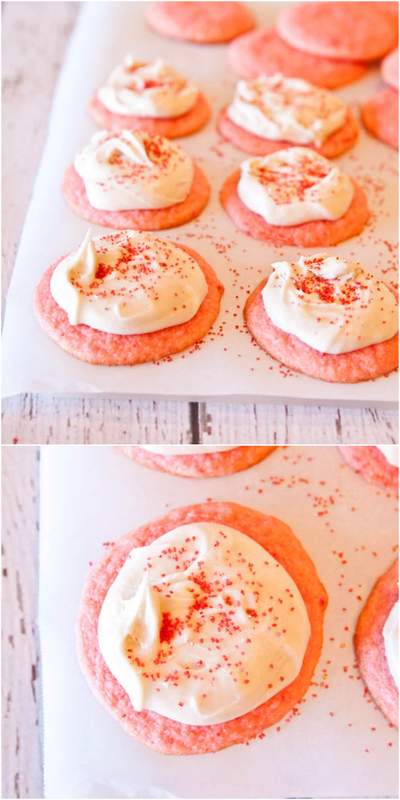 Because these cookies are frosted with cream cheese frosting, you may want store them in the refrigerator if they’re going to be out more than a day or so; use common sense. 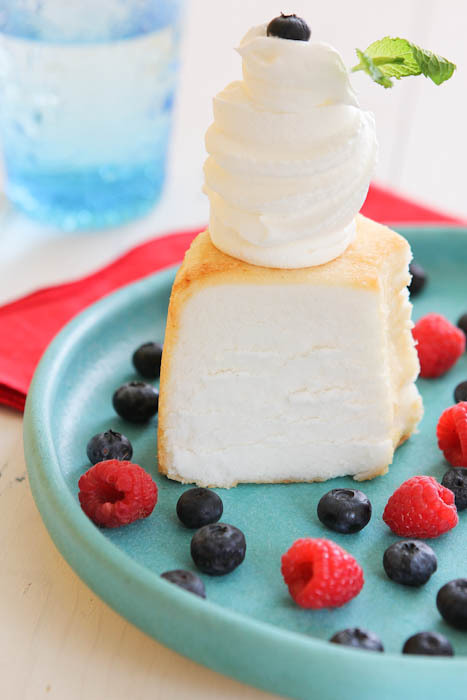 Angelfood Cake with Berries and Cream is another favorite play on berry + creamy flavors that I enjoy. 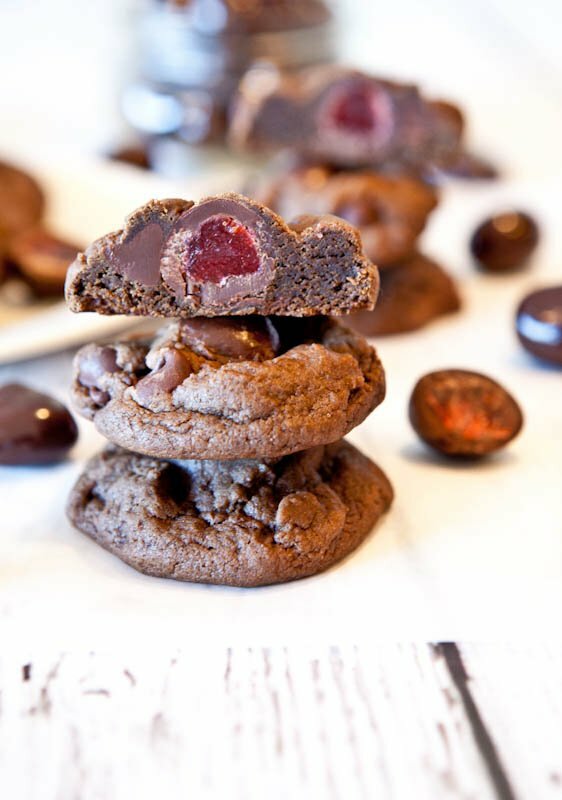 And for Valentine’s Day, Dark Chocolate Chocolate-Chip Cookies Stuffed with Chocolate Covered Strawberries with the red surprise center would be fun.